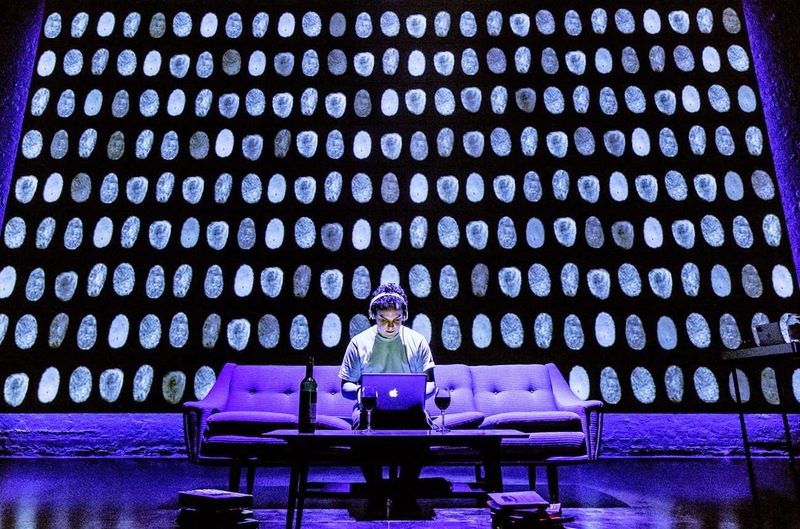 The mise en scene to Privacy is a backdrop that slowly fills with fingerprints as more and more audience members connect to the show’s WiFi. The message is clear. We are all leaving digital fingerprints and James Graham’s play seeks to consider how this geometrically expanding volume of recorded data is used and abused. When George Orwell wrote 1984, shortly after World War 2, the society he envisioned was an horrifically portentous nation, in which all information (and even thoughts) was accessible to a totalitarian state. Orwell’s opus was a magnificent work of literary art. But where Orwell composed fiction, Graham’s work is largely based on fact. Privacy is an exciting play. A pre-show animation, in the style of an airliner’s safety briefing, asks the audience to break with convention and keep their (silenced) smartphones switched on and connected to the theatre’s network. There is a neat joke that asks children to connect their own phones first before helping a struggling adult get theirs on the network. The play that follows is a presentation of the author’s research into how information is obtained about us and how that information is (ab)/used by the state and exploited by commerce. Graham has been thorough and a large part of the play is taken up with verbatim reproductions of interview text. The play is fascinating and chilling and his combination of excellent acting with revelatory facts about the data that one’s iPhone is continually recording, makes for occasionally electrifying drama. 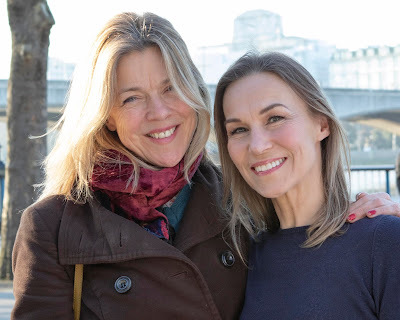 But whilst the verbatim genre may be new to theatre, its style has been around for a long time on TV and there are moments when Privacy seems little more than a live-action episode of Panorama. A slick projection screen enhances the action and graphically indicates how with the UK sitting at a critical junction of most of the world’s fibre-optic data networks, as one character suggests, the UK’s security services are “basically Sky+ing the internet”, a phrase that is mind-boggling in its simplicity. Factually the play is terrific and it is only when Graham augments his research with creative writing, that the chinks appear. A police shooting of suspected terrorists is given a kitsch Romeo and Juliet parallel that is almost insulting in its naiveté, whilst the plays denouement lacks credibility. Graham also muddles his arguments. Michelle Terry’s perfectly nuanced take on an (anonymised) 16 year-old speaking of the online bullying stemming from the ask.fm social networking site that has led to numerous teenage suicides, was poignant and painful and touched the audience with its implicit tragedy. In shifting his focus towards the Snowden leak of state secrets however, Graham’s points become blurred. Snowden’s actions are not in question, but whether he was a champion of freedom, or alternatively a traitor, is very much a matter of personal and political opinion and Graham’s prose seems too heavily weighted towards defending the actions of The Guardian newspaper in releasing the Snowden files. The cast of six are all outstanding, seamlessly interweaving between characters (only Joshua McGuire who plays The Writer is granted one role throughout the play) with Gunnar Cauthery’s take on William Hague and Jonathan Coy’s Paddy Ashdown being particularly fine caricatures. Josie Rourke directs with pace though at times the second half flags. Whilst there may well be more heat than light to Graham’s analysis and at nearly three hours it’s a long haul, for the most part it proves to be entertaining theatre. Innovative and challenging, Graham does not provide many answers in his work, but he will shock you into realising just how many digital fingerprints we are all leaving, everywhere.